Learn how to use a computer graphing tool to engage your students as they graph equations and data sets or experiment with physics simulations. Help students explore the relationship between math equations and their application in the real world with roller coaster and rocket launch simulators. Space is a harsh environment. When an astronaut goes into space, his or her body immediately begins to change, causing the astronaut to feel and even look slightly different. During this seminar, you will get information about the effects of microgravity on astronauts. You also will be guided through three student activities, which provide a first-hand look at the effects of reduced gravity on bones, the fluid shifts in the body and the amount of oxygen needed to survive. The NASA Explorer School project was honored with an Emmy Award from the Lower Great Lakes Chapter of the National Association of Television Arts and Sciences on June 2, 2012. NASA Now, a weekly 5-7 minute video program is a classroom resource for teachers to show grades K-12 students what a scientist, engineer, or technician looks like, sounds like, and what kinds of work they do at NASA. Each week, students see real people putting science, technology, engineering and mathematics to work in the unique context of NASA careers, missions, research and facilities. NASA Now received the prize for production excellence in the category of Informational/Instructional: Program/Series or Special. 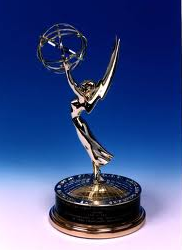 View the NASA Now entries for the Emmy Award. Observations from NASA’s Wide-field Infrared Survey Explorer have led to the best assessment yet of our solar system’s population of potentially hazardous asteroids. The results reveal new information about the asteroids’ total numbers, origins and the possible dangers they may pose. Potentially hazardous asteroids are a subset of the larger group of near-Earth asteroids. The PHAs have the closest orbits to Earth’s. They come within about 8 million kilometers (5 million miles) of Earth and are big enough to survive passing through Earth’s atmosphere. PHAs could cause damage on a regional, or greater, scale. This story is a great extension to NASA Now: Primitive Asteroids: OSIRIS-REx, where Dr. Joseph Nuth discusses a mission to a near-Earth asteroid. This NASA Now program is available on the NES Virtual Campus. To read more about potentially hazardous asteroids, visit https://www.nasa.gov/mission_pages/WISE/news/wise20120516.html. With the moon as the most prominent object in the night sky and a major source of an invisible pull that creates ocean tides, many ancient cultures thought it could also affect our health or state of mind — the word “lunacy” has its origin in this belief. Now, a powerful combination of spacecraft and computer simulations is revealing that the moon does indeed have a far-reaching, invisible influence — on the sun, or more specifically, the solar wind. To read more about our moon’s effect on solar wind, visit https://www.nasa.gov/topics/solarsystem/features/electric-moon.html. This article is a great extension to the NASA Explorer Schools featured lesson, Geometry: Space Math Problems — Solar Storms. To access this lesson, visit http://explorerschools.nasa.gov. NES educator Kaci Pilcher Heins has a great way to get students involved with STEM — high-altitude ballooning! She says, “Usually each state has a ballooning organization and is very willing to get students involved. We are heading to Embry Riddle Aeronautical University in Prescott tomorrow (April 12, 2012) to launch our payload of temperature sensor, pressure sensor, camera, and sensitive film to try and capture gamma rays on board a high-altitude balloon. This is also a great opportunity for my sixth-graders to talk with university students as we tour the campus.” Pilcher Heins reports that they are also using amateur radio with the repeater on the balloon. Here are pictures of Earth taken during the flight on April 12. Directly related to this activity is the NES featured lesson, Engineering Design: Forces and Motion — Balloon Aerodynamics. And be sure to take a look at the May 2 NASA Now program, Balloon Research. Receive information about the applications of linear equations at NASA and learn how to implement the Breaking Barriers activity. Breaking Barriers provides students an opportunity to step into the shoes of a NASA engineer to design, build and test an X-1 balloon. For more information and to register for this Web seminar visit https://digitalmedia.wufoo.com/forms/nes-webinar-registration-linear-equations/. Learn how to implement this is an inquiry-based lesson for students on how atmospheric pressure and vapor pressure affect the boiling point of water. See why the boiling point of water is pressure-dependent, rather than temperature-dependent. Then, by extension, they deduce if there could be liquid water on Mars. For more information and to register for this Web seminar, visit http://learningcenter.nsta.org/products/symposia_seminars/NES2/webseminar25.aspx. The seasons on Earth are caused by the tilt of the Earth as it rotates on its axis and revolves around the Sun. The 23.5 degree tilt of the Earth’s axis results in changes of the angle of incident sunlight. A common misconception among students is that the seasons are caused by the distance between the Earth and Sun. In fact, summer in the Northern Hemisphere occurs at aphelion, the farthest distance between the Earth and Sun, and follows summer solstice when incident sunlight is most concentrated along the Tropic of Cancer, 23 degrees 26 minutes 22 seconds. Middle school educators are invited to join NASA for the International Space Station EarthKAM Summer 2012 Mission from July 10-14, 2012. Find out more about this exciting opportunity that allows students to take pictures of Earth from a digital camera aboard the International Space Station. For more information about the project and to register for the upcoming mission, visit the http://EarthKAM home page. If you were a participant in the NASA Explorer Schools, or NES, project in the 2010-2011 school year, you are now able to enroll in the project for the upcoming school year. By enrolling, you will ensure that you have continued access to NES’s engaging and exciting classroom materials, including updates to the Virtual Campus and a fresh collection of NASA Now and Live Chat events planned for the upcoming year. If you registered for the NES Project for the first time on or after May 18, 2012, you do not need to complete a 2012-2013 enrollment form. You are already registered for next year! Are you wondering why you have to enroll for next year? NES wants to keep an up-to-date record of active project participants. In order to do so, we are asking all current participants to enroll in the project for the upcoming year. When you log onto the Virtual Campus, you will receive a prompt to fill out a brief enrollment form, where you can indicate any changes to your personal, classroom or school information. Then all you have to do is click “submit” and you’ll be ready to take advantage of NES’s educational resources and bring your 2012-2013 STEM classroom curriculum alive! For answers to frequently asked enrollment questions, see the NES FAQ page, or email your questions to the NES Help Desk. To find out more about the Satellite Meteorology lesson, go to Weather and Climate: Satellite Meteorology on Facebook, or read about it in NEON. NASA Now: Earth and the Solar System — Juno. Tracy Drain, a Juno systems engineer from NASA’s Jet Propulsion Laboratory, discusses the Juno spacecraft and what scientists hope to learn when it reaches Jupiter. This program is available on the NES Virtual Campus beginning June 13.